This pen is an example of the sort of extra work that can come from not resting upon one’s laurels. The 61 was meant to be the replacement for the “51” at the top of Parker’s line-up in the new era of ball-point pens, which happened also to be the era of the cartridge loading pen. Apparently, the Aerometric filler of the older pen (which had replaced the Vacumatic filler in 1948) was still too cumbersome and potentially messy for the businessman of the late 1950s– one still had to, after all, use something to wipe a tiny bit of residual ink off the end of the pen. The 61 got around this “problem” with a capillary filler– just open the pen, drop the back end of the pen in the ink bottle, wait a few seconds, and then screw it back together. Wiping was abolished through the new miracle space-age science material Teflon, which coated the outside of the filler and to which ink could not cling. The inside of the filler contains a roll of textured plastic, providing a large surface area for ink to cling to as it slowly makes its way to the point. The 61 is a very slick pen, but is not without problems. One is that the first uses of miracle space-age science materials frequently don’t work so well. Teflon-bonding wasn’t particularly reliable in 1957, and the coating tends to flake off the filler– meaning it needs a wipe. The plastic of the outer body, unlike stodgy old Lucite in the “51”, is not so stable either, and tends to shrink and embrittle. The former problem can be merely cosmetic (leading in many cases to loss of the “point is here, dummy” arrowhead decoration on the hood), while the latter can be the end of the pen when the hood falls to bits. Even fully functional, the filler is problematic. When empty, it can take as much as five minutes to fill properly. Because it’s open at both ends, the ink can dribble out; there’s a little spring-loaded gasket in the end of the barrel to seal it in use, but that can get debris, like bits of Teflon, on it to render it ineffective. It is also hard to clean; one was not expected to change inks frequently, if at all. 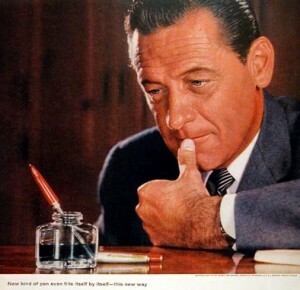 Later models did away with the capillary filler, as clogging was apparently one of the major complaints Parker got at the time, but are still a bit fragile. There are three distinct eras of the 61. The first, ending in about 1962, has a trim washer rather than ring at the joint (as I don’t have one of this sort, you may get a notion of what that looked like by glancing at the Hero 330). 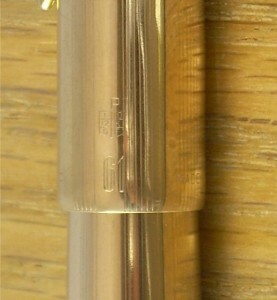 The second variant has a more substantial trim ring, and the third, which came out in 1969, replaced the filler with a cartridge fitting. There were also a variety of trim levels, as there had been for the “51”, which included Flighter and gold-covered models. I like this pen, and some declare that they contain the best points Parker ever made. However, with one of the early capillary models, I have to say that unless you want one for the novelty value, as I do, I can’t recommend them unreservedly. While nice to write with, the reputation of the plastic leads to shakey nerves, and they are indeed devils to clean; this pen more than most should have a “No User Servicable Parts” label on it. On the topic of novelty value, this pen is one of the very few which will write indefinitely with the point uppermost, as getting ink to the feed has no reference to gravity; the reservoir and the feed are all connected by capillary material. If one finds a pressing need to write upon a ceiling, this is the pen for the job. 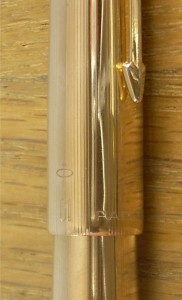 To keep the clutch fingers in the cap from deforming the section, it is wise to store this pen without the cap on. Cost When New: $20.00 for the base model in 1956 (for modern value, try this calculator). Size: 13.1 cm long capped, 14.2 cm posted, 12.3 cm uncapped (base model). Body: Polystryene, in some models sporting a metal overlay. Filler: Capillary, which combines with the collector to make the estimate of capacity very difficult, so I will say capacity approx. 1.1 ml ± 0.3 ml. From 1969, they used cartridges of approx. 1.2 ml. 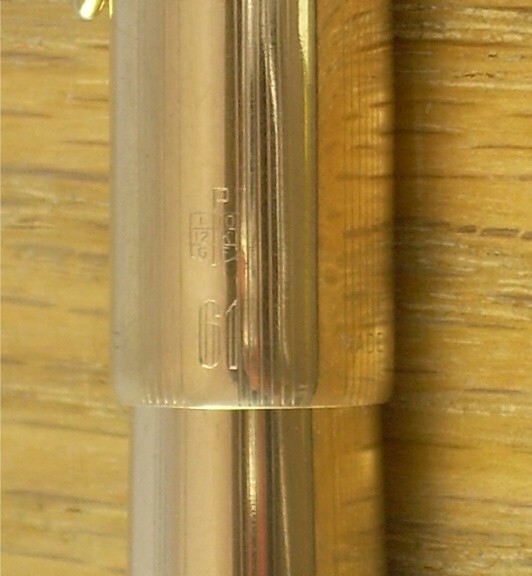 Parker 61, 1962 – ’69 pattern, in the basic “Classic” trim. 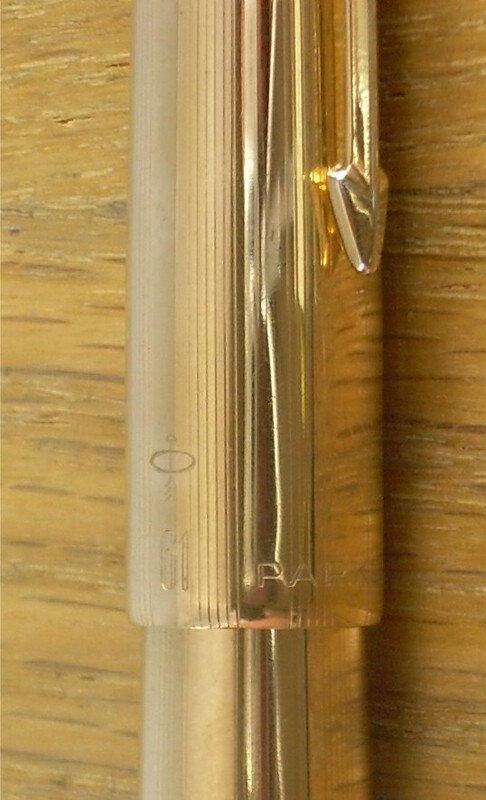 Parker 61 Insignia, with rolled gold cladding. This trim appeared in 1958. Detail of the “Halo” trademark which Parker began using about 1958, and of the grouped lines that decorate the body.